Don't miss a rare opportunity to hear one of New Jersey's most unique concerts as The Baroque Orchestra of New Jersey under the baton of Maestro Robert W. Butts welcomes pianists Ron Levy and Soyeon Kim for an afternoon of concertos for orchestra and two pianos! 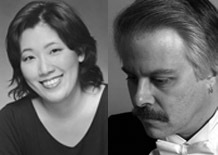 Soyeon Kim and Ron Levy will perform concertos by Johann Sebastian Bach, Wolfgang Amadeus Mozart and Francis Poulenc. These exciting masterpieces are filled with wonderful challenging music. Poulenc's 1932 composition is also filled with varied quotations from other works. Come early and enjoy a pre-concert performance by Fortissimo Flutes, conductor Diana Charos Reilly. Fortissimo Flutes are an ensemble of the New Jersey Youth Symphony. An added concert treat will be the orchestra's performance of Overture to Iphigenea en Aulide by Christoph Willibald Gluck.